| What is Baseline Shield? 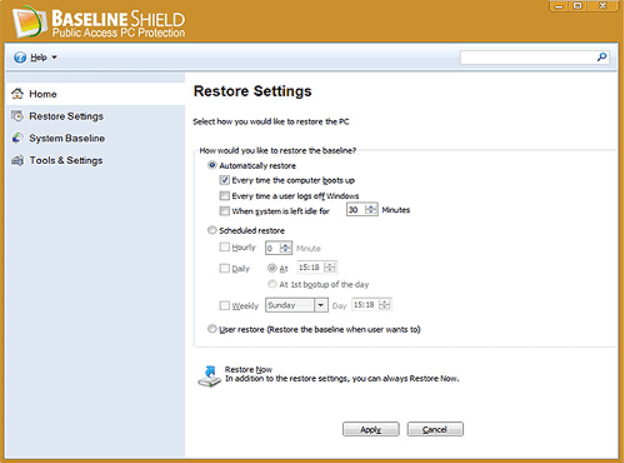 Baseline Shield is an instant restore software for public access computer. It resets computer to its pristine condition with a simple restart, regardless of what user may have done to the computer such as erasing files, installing new software, downloading programs or deliberately tampering with Windows registry settings. Baseline Shield makes public access computer perfectly configured and ready for the next user. | Who needs Baseline Shield? Schools Computer Labs, Libraries, Internet Cafes, Kiosks or any other public access PCs. 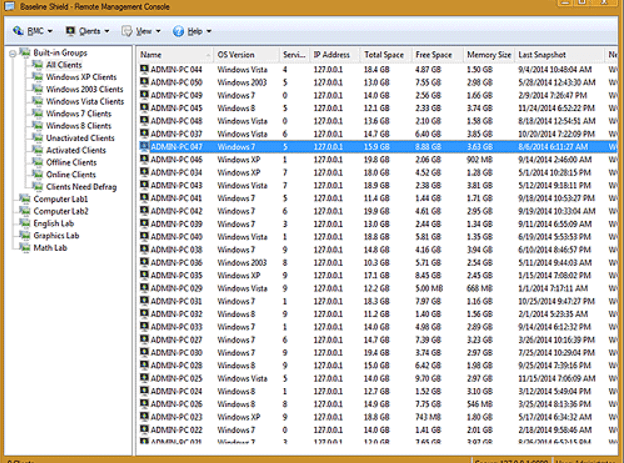 Baseline Shield does not require hidden partition or reserved disk space to install. Baseline Shield takes very little system resource. Baseline shield provides absolute desktop integrity from any known or unknown software threats. 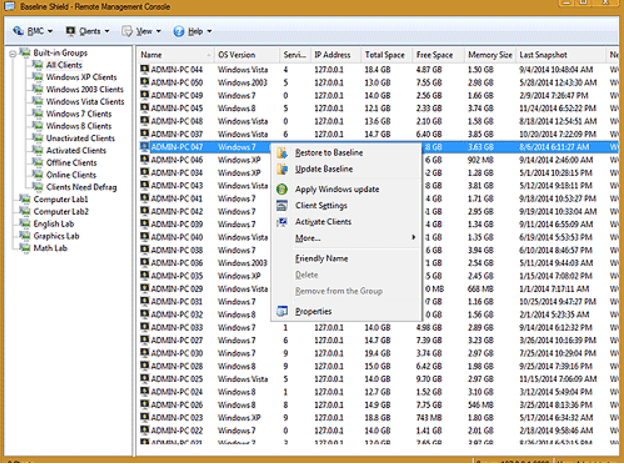 Baseline Shield can update the baseline snapshot regardless the hard disk size and system size in less than 5 seconds without interrupting your work. Baseline Shield can schedule Windows update, software update and Antivirus update without requiring the cumbersome "disable protection, apply update, re-enable protection" process. Baseline Shield offers great flexibility. You can set Baseline Shield to restore system on reboot, logoff , every hour, every day, 1st boot up of the day or every week. 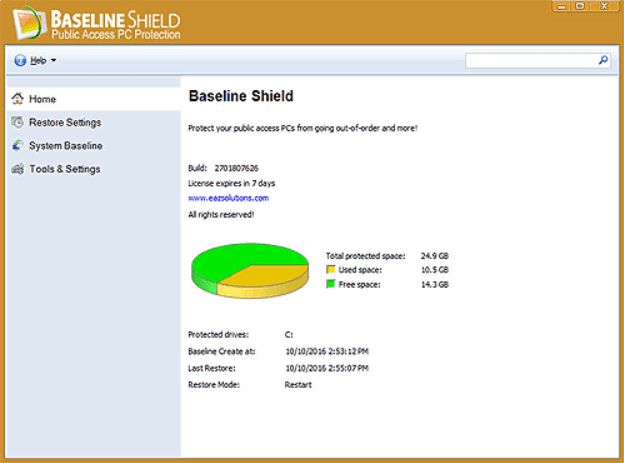 Baseline Shield can be configured to be completely invisible from end users. Baseline Shield comes with deployment utility for easy and fast deployment. Baseline Shield comes with a FREE remote network management console (RMC) that allows you to organize and remotely manage client workstations in LAN or WAN in a graphical console. Baseline Shield is simply the most robust and most flexible public access computer protection solution in the market. Baseline Shield supports both 32 and 64 bit of Windows XP, Windows Vista, Windows 7, Windows 8.x and Windows 10 (MBR or GPT disk; Legacy or UEFI BIOS).